Location: Meeting Room 3, 2nd Floor, Administration Bldg. Rabbis Greengrass and Kempler are back with their weekly book club! 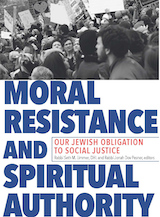 Join us Mondays starting February 4th for 12 sessions as we read and discuss Moral Resistance and Spiritual Authority: Our Jewish Obligation to Social Justice. This new book — published by CCAR Press — contains a collection of essays from rabbis around the country, including our very own Rabbi Greengrass! To purchase a book at a discounted price of $15, contact Janice Baisman at jbaisman@tbam.org.